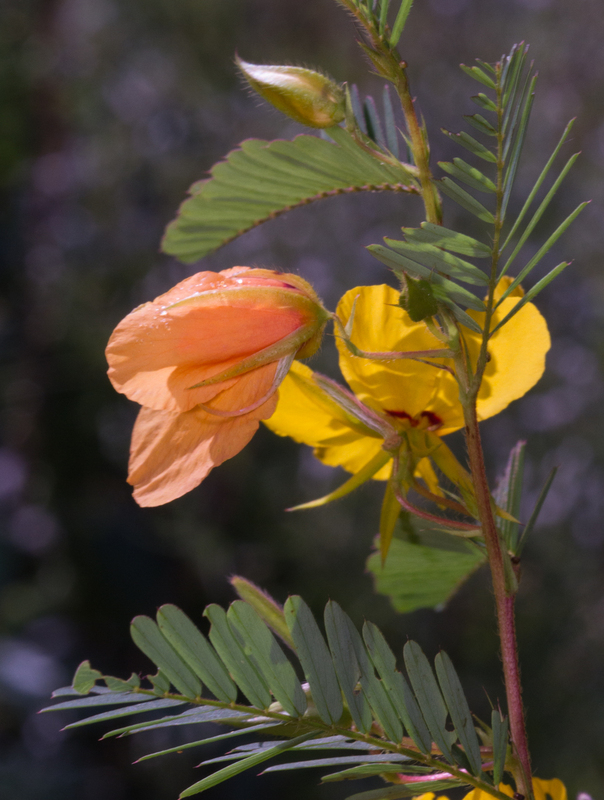 There is more both of beauty and of raison d’etre in the works of nature- than in those of art. 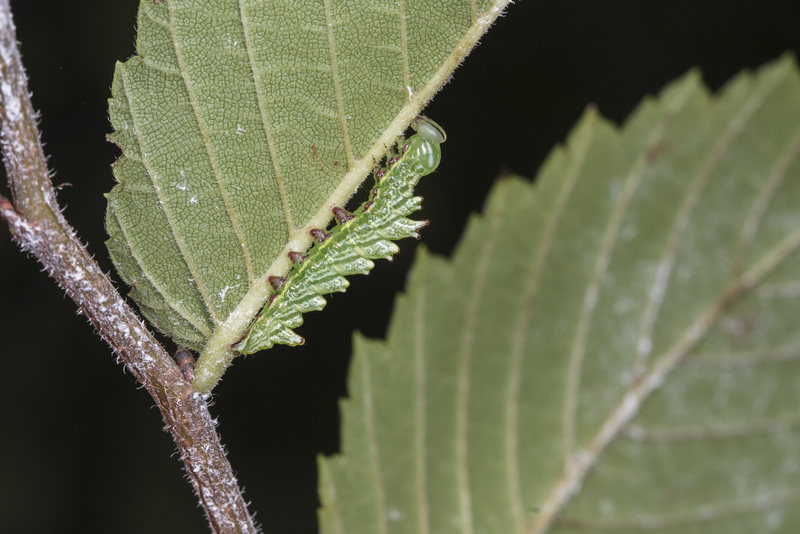 One of the most exciting finds was a group of double-toothed prominent caterpillars (Nerice bidentata) on an elm sapling. These guys are amazing in that they have noticeable fleshy “teeth” on their dorsum that mimic the double serrated leaf edge of elm leaves, their host plant. Several of them molted over the past few days and I noticed what seems like a slight change in behavior between the different sizes. 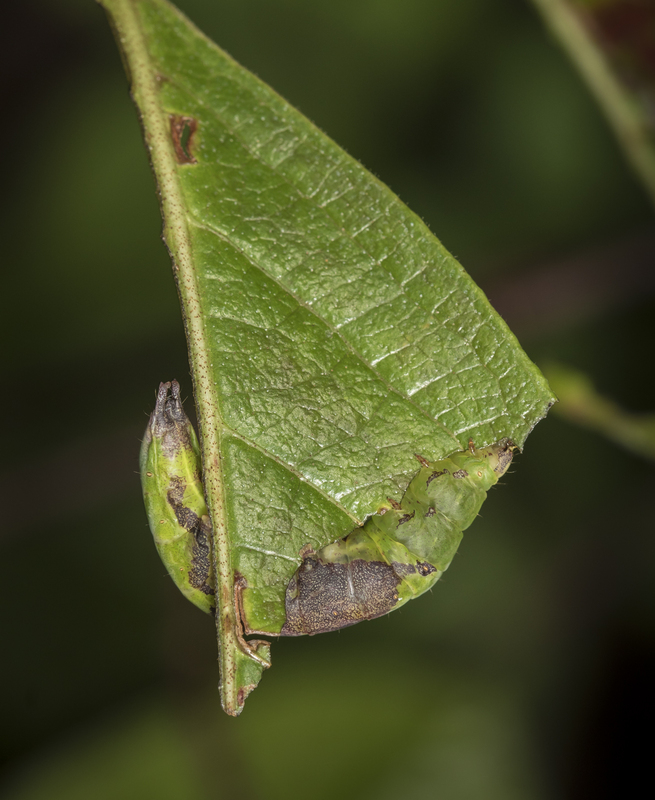 The smaller larvae are somewhat darker in color and seem to feed along the leaf edges in a more exposed position. 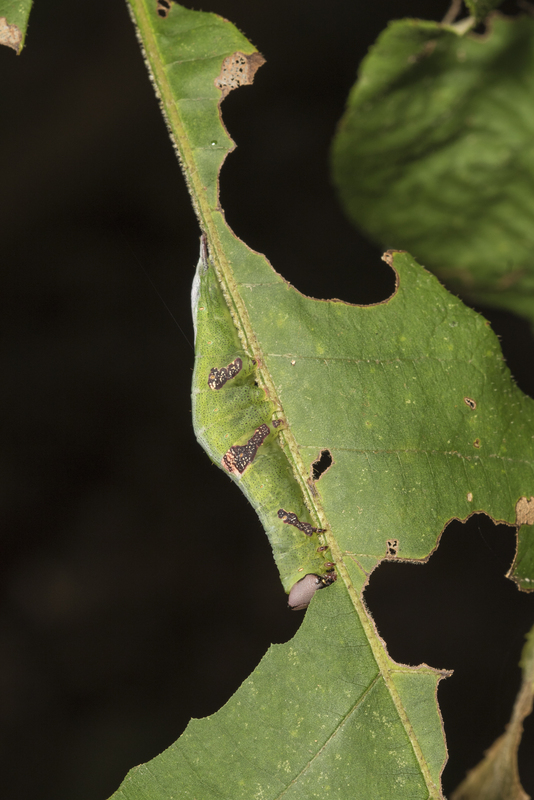 The brown tips of the prolegs match brown spots along the mid-vein of the leaf. 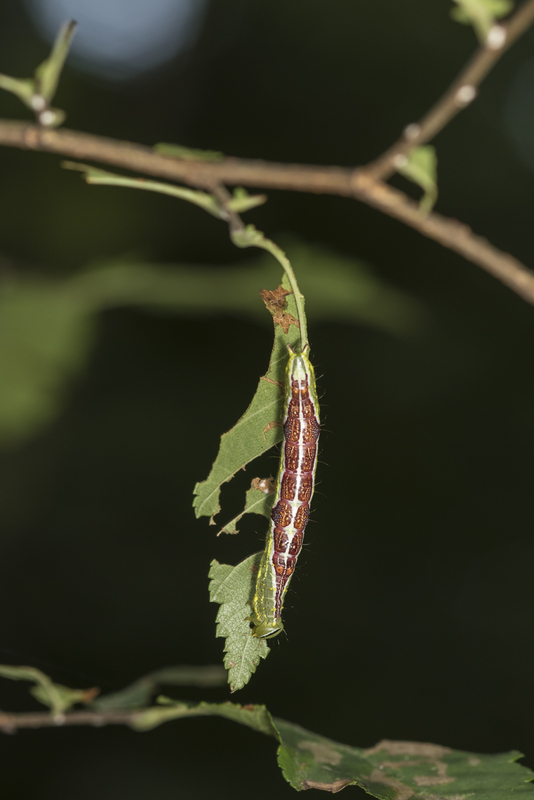 Larger larvae appear lighter in color, and seem to feed at an angle that puts them slightly under the leaf. 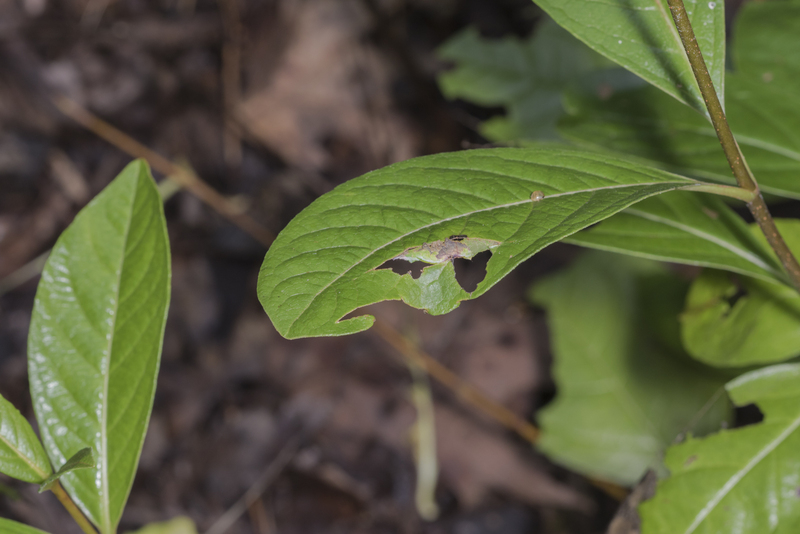 The leaf underside is lighter in color than the top, so maybe this is why. 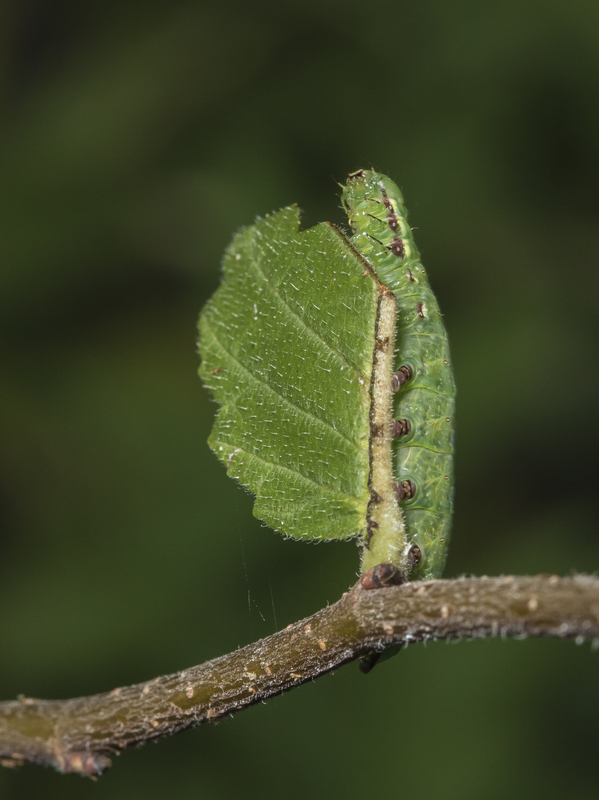 The larvae also have angled stripes along their sides which mimic the venation of the leaves, adding to their effective disguise. 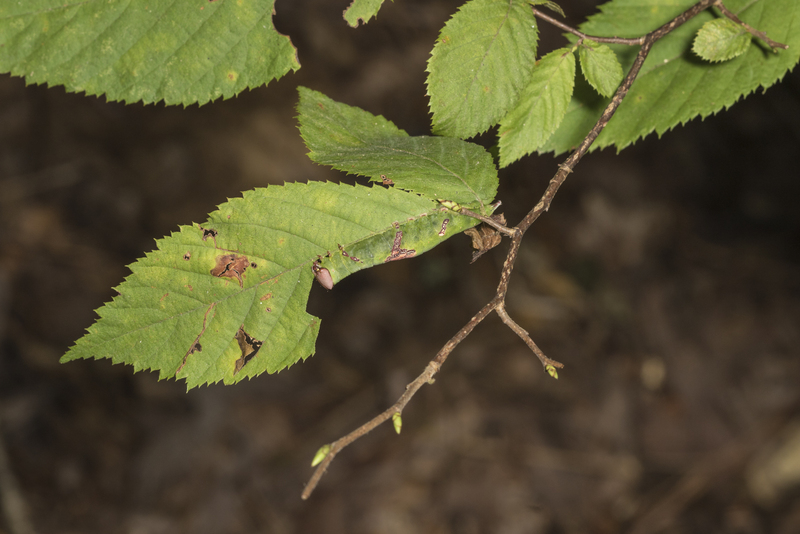 While looking at other elm saplings, I came across another species that seems to mimic both the leaf edge and the twigs of its host plant. 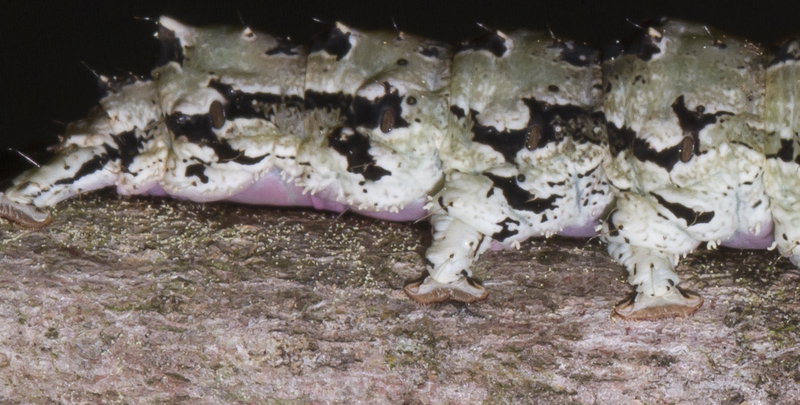 When viewing the dorsal surface of a double-lined prominent (Lochmaeus bileneata), the reddish-brown color resembles an elm twig. 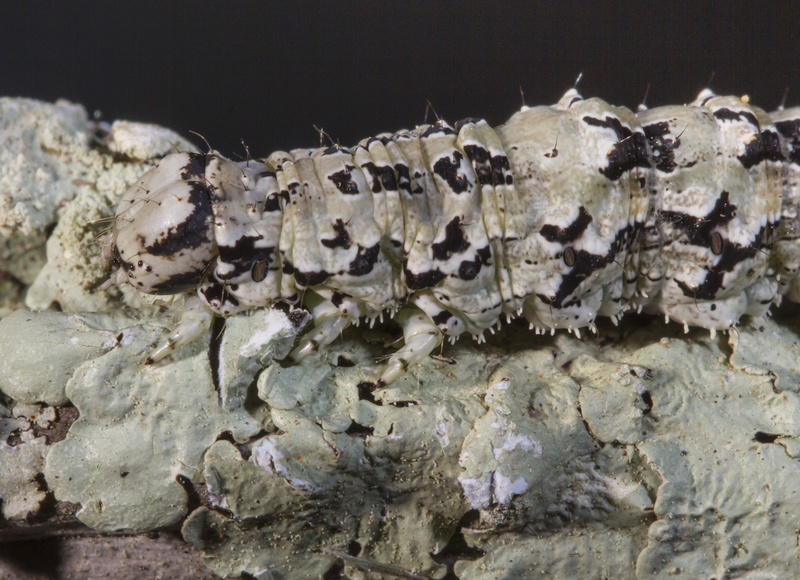 When viewed from the side, the white and yellow stripes along the cater[pillar’s body look like the mid-vein of a leaf, and the brown resembles dying leaf tissue. 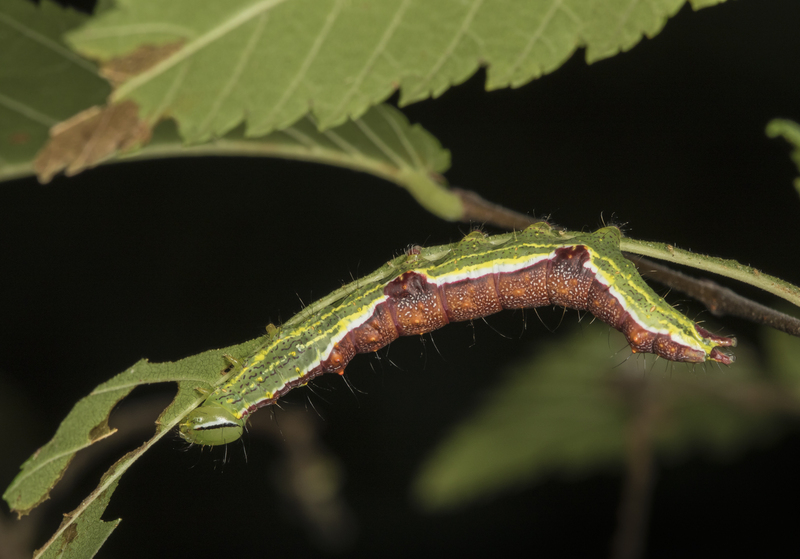 The feeding position (head towards the tip of the leaf, body along the mid-vein) reinforces the effectiveness of the cryptic pattern and colors, with even the stripes on the head capsule resembling part of the angled leaf venation. I suppose it should come as no surprise that I can spend hours wandering around the yard, amazed by the small wonders all around me. I hope you all can spend some time outside this holiday weekend and discover wonders of your own. 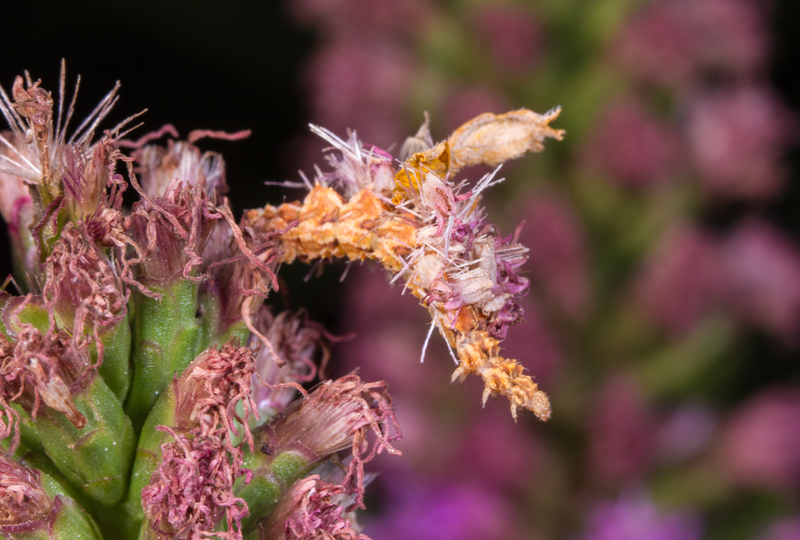 I shared some images last week of one of my favorite moth larvae, the unicorn caterpillar. Their shape, coloration, and behavior allow them to blend in remarkably well with their environment. 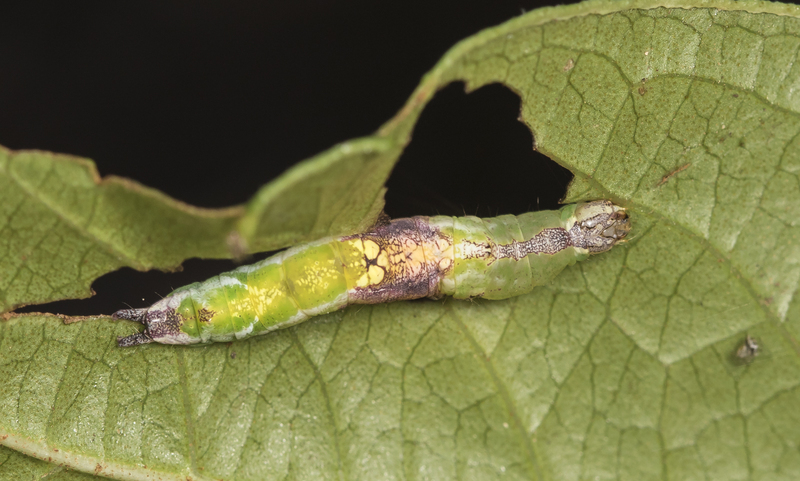 Turns out, they are not alone in their ability to hide in plain sight along the edges of leaves. 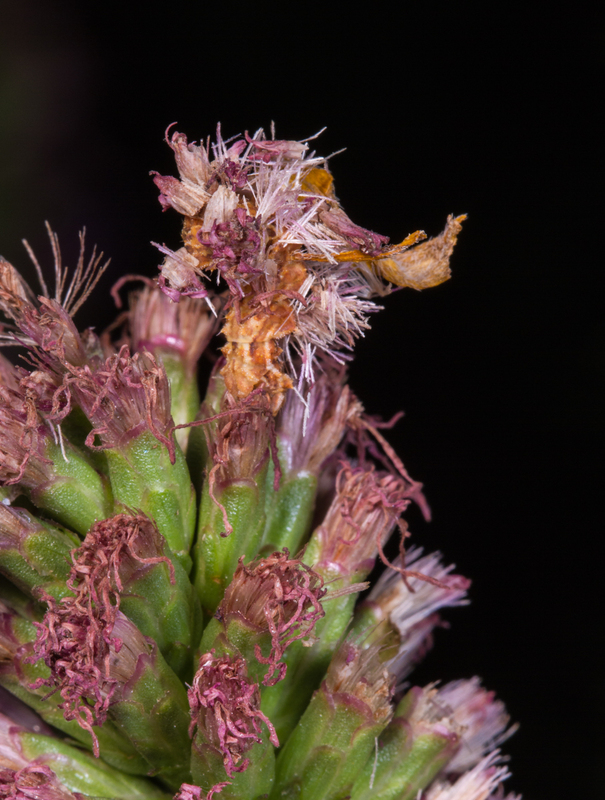 It is a common strategy of many caterpillars, and I was delighted to find a few other species of leaf edge mimics in the yard over the past few days. 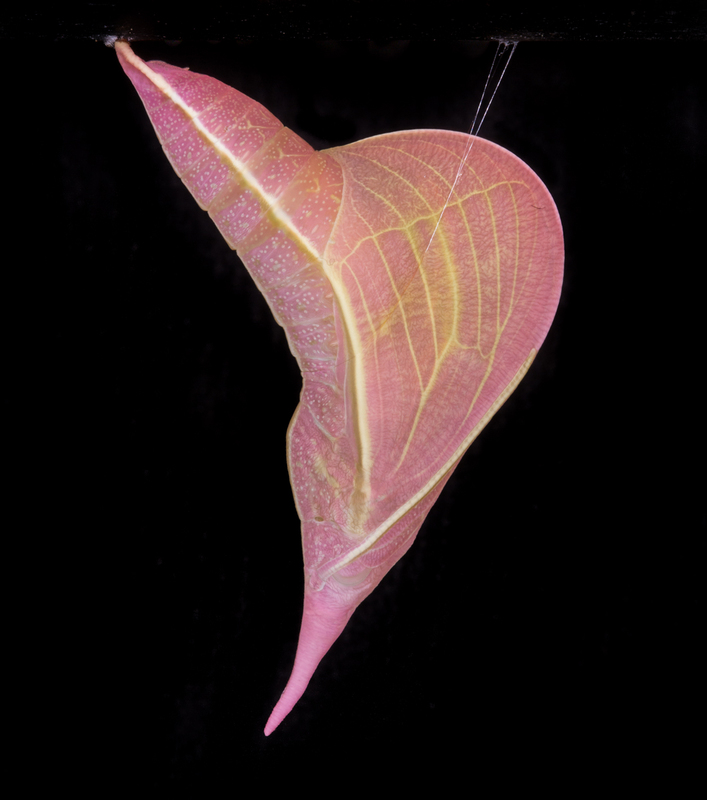 One of the more remarkable leaf edge look-alikes is the wavy-lined heterocampa, Heterocampa biundata. 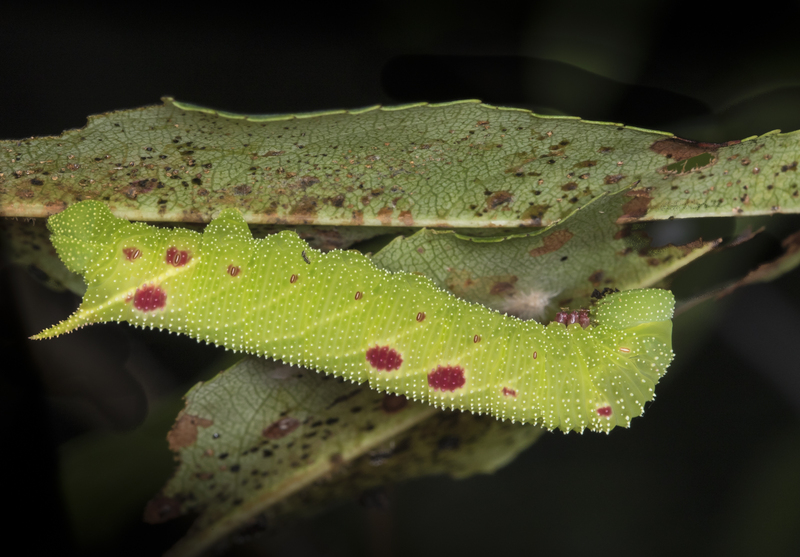 It is variable in color, but frequently has brick red and white splotches along its sides that resemble necrotic leaf tissue. I assume this is a particularly effective camouflage for species that live during late summer and early autumn when many leaves are pock-marked by such splotches. 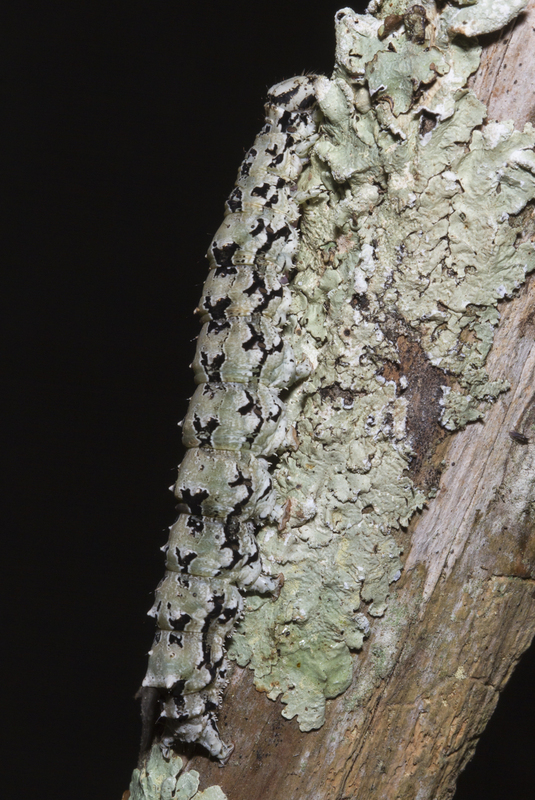 This species is a generalist feeder on a variety of woody plants (I found them on two species of trees here in the yard). 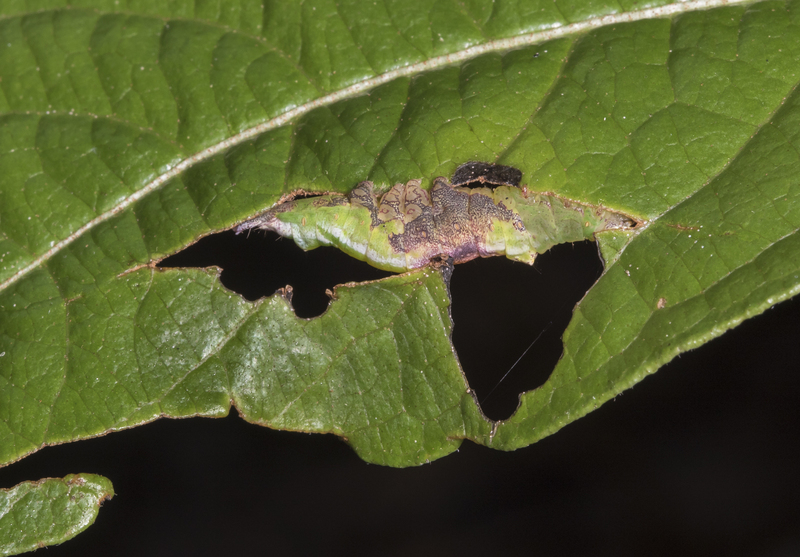 In addition to the leaf splotch patterns on their sides, they tend to align themselves along leaf edges in the areas of leaf they have devoured. The slight bump along their dorsal surface outline helps with this camouflage by making them look more like a leaf edge contour. 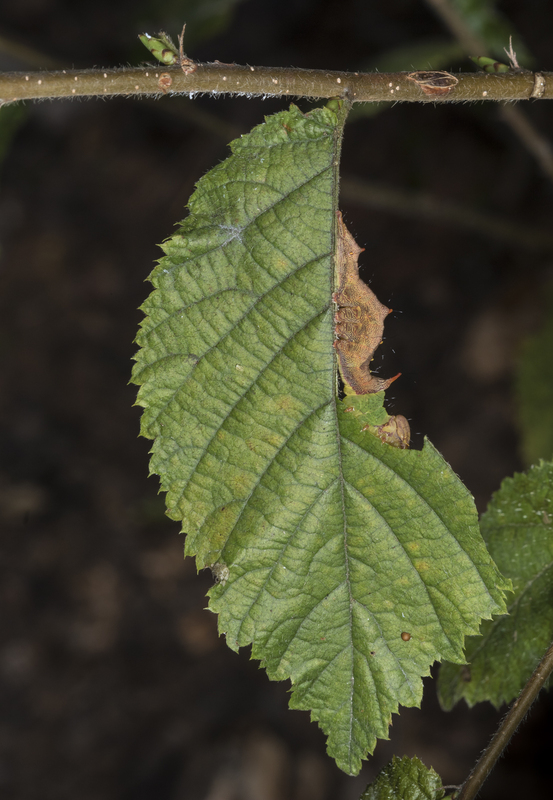 Another excellent leaf mimic is the chestnut schizura, Schizura badia. 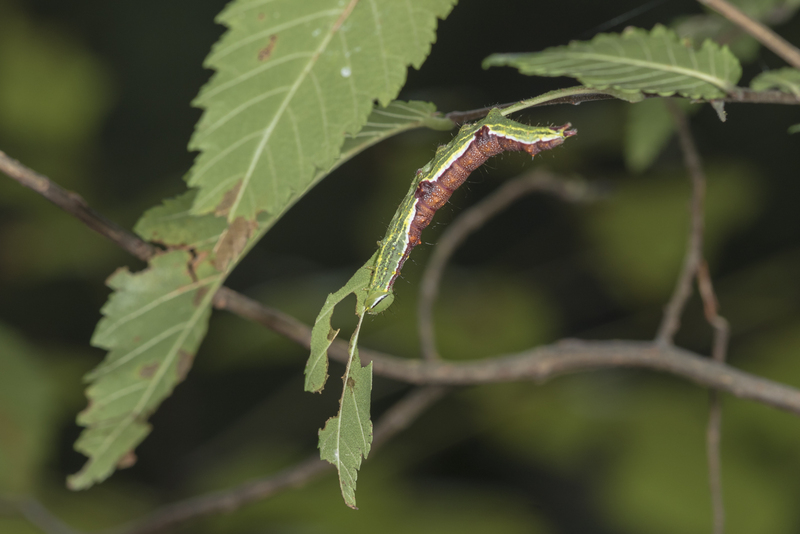 I found a few feeding on the leaves of a possumhaw, Viburnum nudum. 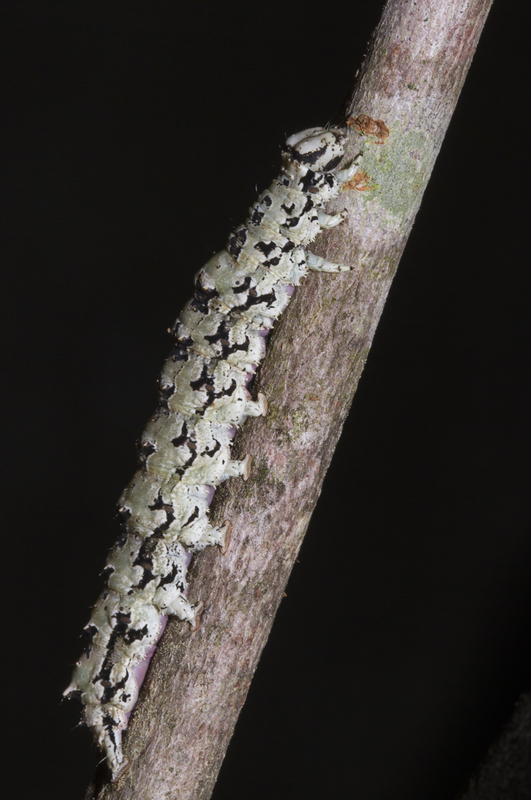 They tend to place themselves inside the outline of portions of a leaf they have consumed, once again making for a well-camouflaged caterpillar. 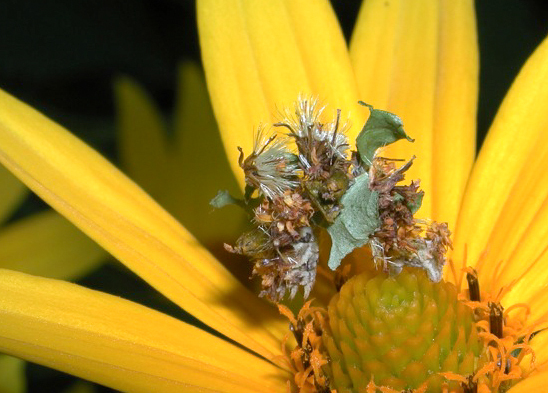 They also have brownish splotches that mimic dying leaf tissue. 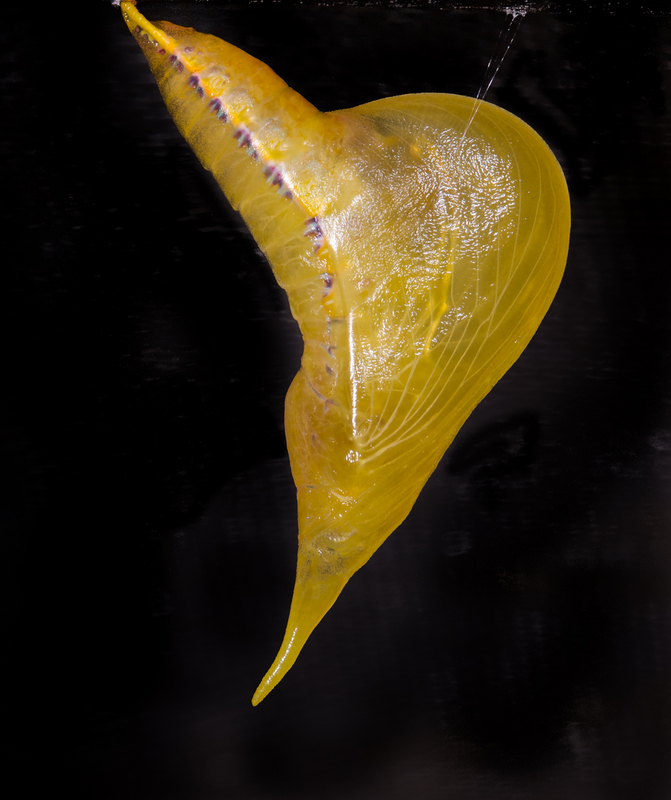 This species is characterized by a diffuse yellow saddle over the dorsum of the abdomen and a large, irregular-shaped, brown patch on the sides. 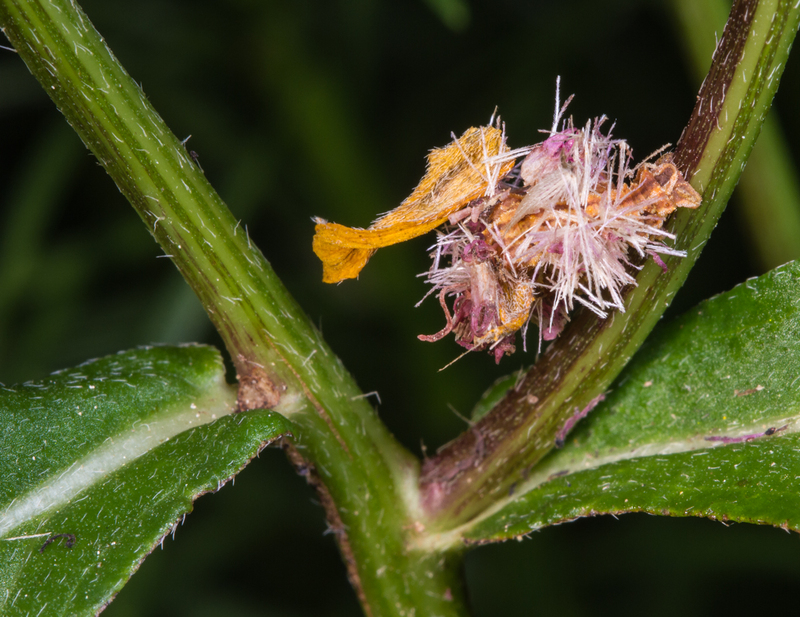 It is a close relative of the unicorn caterpillar and also has the ability to shoot a blend of acids at would-be predators. 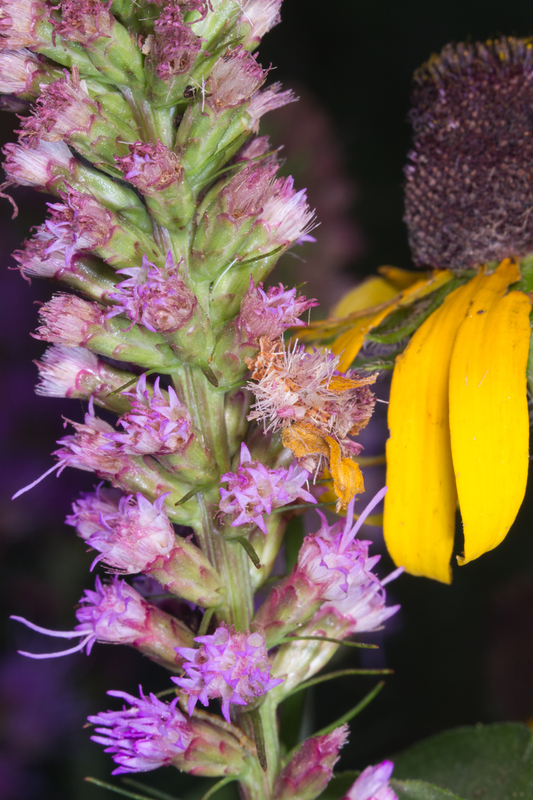 The defensive spray comes from a thoracic neck gland and can be shot a distance of up to several inches. 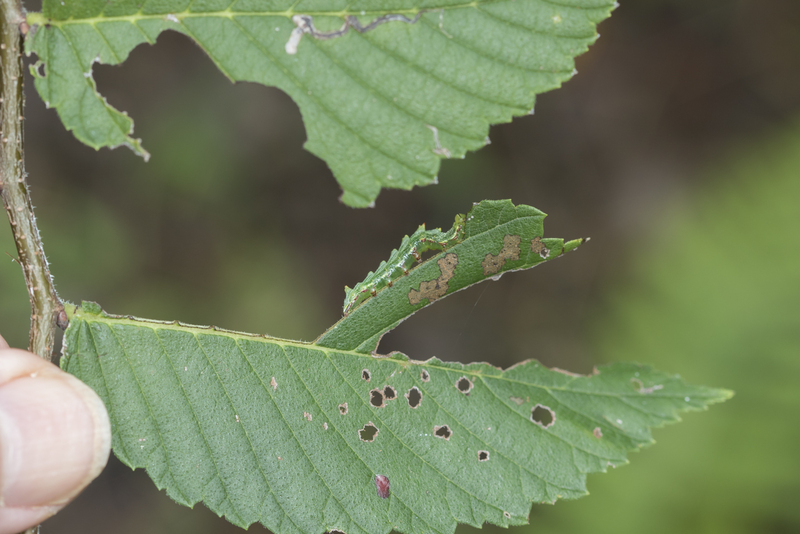 Although not a leaf edge mimic per se, the other species I found yesterday does a good job of looking like a common leaf pattern on its host, wild cherry. I am pretty sure this is the first of its kind I have found in my years of caterpillar hunting. It is a small-eyed sphinx, Paonias myops. The red splotches certainly are excellent mimics of the pattern on the underside of many wild cherry leaves this time of year. The behavior of this species helps with this deception as it tends to stay underneath leaves (where the leaf splotches are most noticeable) during the day and then comes out to feed mostly at night. 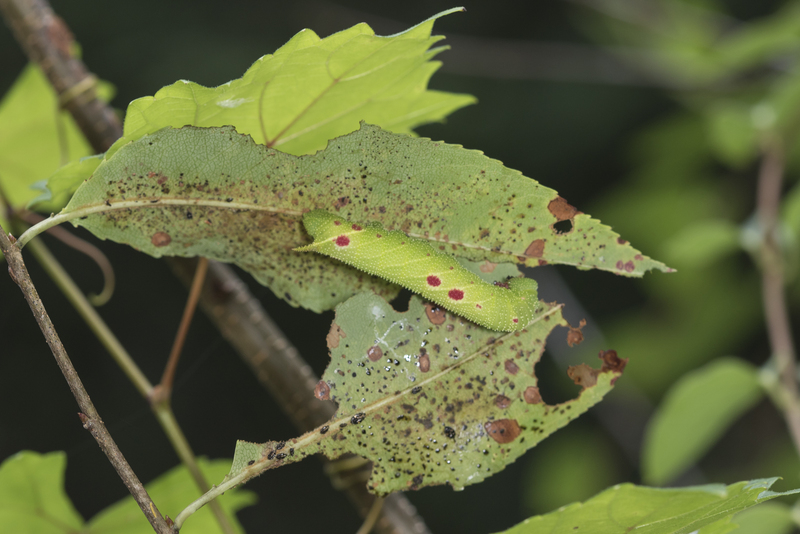 Wagner, in his excellent reference, Caterpillars of Eastern North America, wonders if the spots are more apt to occur on individuals feeding in the autumn, when cherry leaves tend to have more splotches. 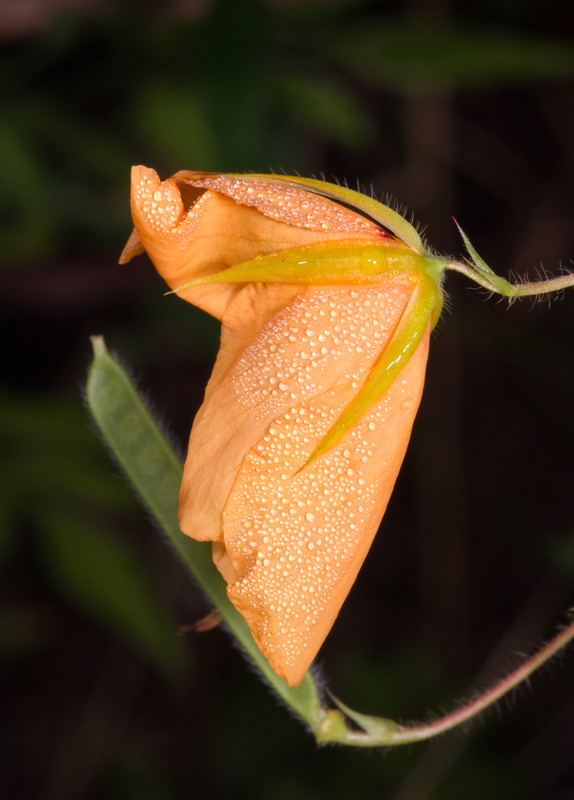 I continue to be amazed at the intricacies of nature found just outside our door. 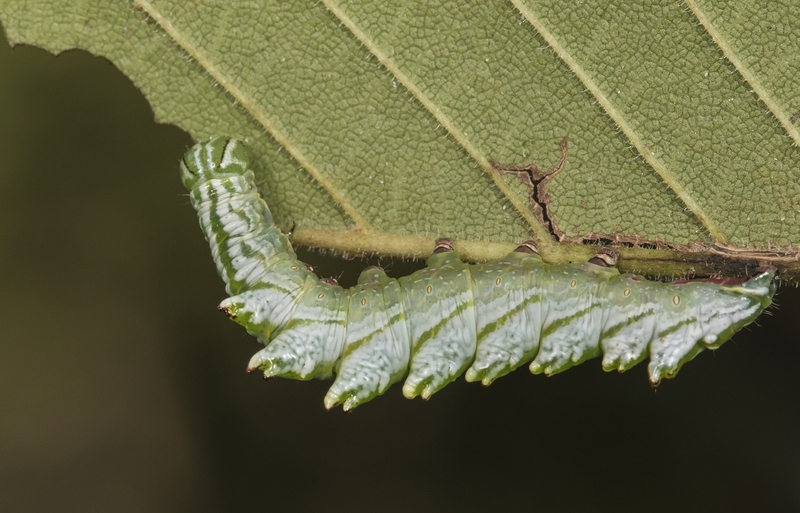 More on some other leaf edge larvae in my next post.